The use of models has been important to the historical and contemporary study of the human brain, yet very little study by social scientists has been dedicated to how the brain sciences develop and use models to better understand what brains are and how they work, including the complex entanglements between brains, bodies and their environments. 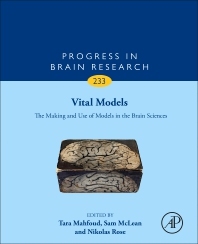 Vital Models: The Making and Use of Models in the Brain Sciences explores the history and use of brain models from clinical psychiatry to psychopharmacology and cybernetics, as well as developments in digital brain modeling, simulation, imaging and connectomics. This timely volume helps both scientists and students better understand the variety, strengths, weaknesses and applicability of models in neuroscience. Tara Mahfoud is a PhD Candidate at the Department of Social Science, Health and Medicine. She has a Masters degree in Social Anthropology from the School of Oriental and African Studies, and a Bachelors degree in Sociology and Anthropology from the American University of Beirut. Her dissertation is an ethnography of brain modeling and simulation in the European Union’s Human Brain Project. Sam McLean is a Teaching Fellow and PhD student in the Department of Global Health and Social Medicine at King’s College London. His work is rooted in the history of philosophy and life science. He is currently working on an ontological history of addiction and memory in addiction neuroscience, and a history of passion and knowledge in European intellectual culture. Nikolas Rose is Professor of Sociology and Head of the Department of Social Science, Health and Medicine at King’s College London. His work explores how scientific developments have changed conceptions of human identity and governance and what this means for our political, socio-economic and legal futures. Rose is a Co-director of the Centre for Synthetic Biology and Innovation (CSynBI), a major research collaboration between King’s and Imperial College London. A member of numerous advisory groups engaging key stakeholders, he has also held high-level academic posts in LSE and at Goldsmiths. Trained as a biologist, a psychologist and a sociologist, Rose co-founded two influential radical journals in the 1970s and 1980s, playing a key role in introducing French post-structuralist critical thought to an English speaking audience and helping develop new approaches to political analysis and strategy. He has published widely across numerous fields and disciplines, with work translated into 13 languages. He is a former Managing Editor of Economy and Society and Joint Editor-in-Chief of the interdisciplinary journal, BioSocieties.